The NETpositive Supplier Engagement Tool enables your company to develop a free NETpositive Sustainability action plan in line with the environmental, sustainability and institutional objectives of your customers. 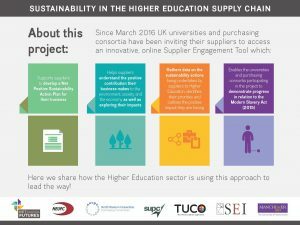 You might have been asked to complete an action plan by one of the purchasing consortia (YPO, NEUPC, NWUPC, SUPC or TUCO), by one of the 48 universities using the tool or by one of YPO’s public sector members such as a Local Authority. The Tool demonstrates that sustainability is not just about reducing energy or recycling but also about how sustainability relates to your core business practice and importantly how to maximise your social value and economic impact through the choices you make and the things you do. This is implicit in our NETpositive approach. For too long sustainability strategies and commitments have been focused primarily on environmental issues and predominantly on the reduction of negative impacts. A NETpositive commitment simply recognises that, as well as reducing negative environmental impacts, we should also pay more attention to enhancing the positive impacts of our individual and collective activity; environmentally, socially and economically. The aim is to achieve an overall position that is NETpositive. You will receive an email link enabling you to register to use the Tool (this is free). You enter some simple information about your company, where you are based and the type of goods or services you provide. The system generates a simple NETpositive analysis, which identifies the potential positive and negative environmental, social and economic impacts of your company. Once you have selected the impacts that you believe are relevant to your company you click on the ‘button to generate your action plan. The action plan generated reflects the impacts you have identified. For each impact; positive and negative, there are a number of actions to keep, delete or add to in order to address the identified impact. You can watch a simple guide to creating your action plan here. Utilise the action plan to communicate what you are actually doing rather than what you are committed to at a policy level. Prepare for contract management discussions on sustainability with your customers. Please note that the link to the Tool is not publicly available, as you will be invited to complete an action plan by one of your university customers, if appropriate, and they will send the link. Use the ‘share’ button at the end of the actions page to give other colleagues access to your action plan. This enables more than one person to contribute to the plan and means you do not need to have duplicate plans for your company. Regularly re-visit your plan to ensure that the information is up-to-date, for example if the information on the universities you supply changes. Also, ensure you re-visit your actions to up-date if you need to mark as ‘complete’ your ‘in progress’ actions or move from ‘not started’ to ‘in progress’. Be sure to add evidence against your actions to demonstrate to your customers what your company is actually doing with regards to sustainability. 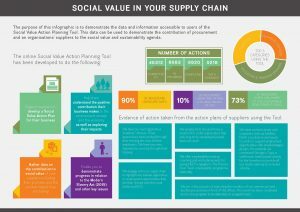 Click on the images below to have a look at some infographics we have produced to illustrate what the data from the tool and your action plans can demonstrate.